After revisiting the history of Novak’s special egg (CVAC pod) and doping in tennis, it is important to address the World Anti-Doping Code. FedererFan07 reader (@Janie5Jones on Twitter) wrote an interesting article heavily based on facts from WADA (World Anti-Doping Agency). Read the post titled, The Egg Conundrum. 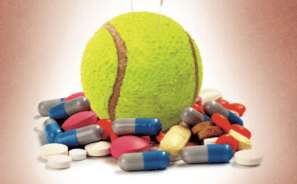 The source of all pertaining information is the code, written to assist WADA with their core principles (promote, coordinate and monitor the fight against doping in sport in all its forms). Have a quick reread of an excerpt from the WSJ (Wall Street Journal) summarizing this controversial CVAC pod based on a statement from CVAC Systems (company who made the pod). That is some fine detail noted and some bold words stated by Ruszkowski, the chief executive of the company (CVAC Systems) which makes this pod. The claims made by the company behind this technology are eye-opening. Many performance enhancing drugs boost athletic performance by doing nearly the exact same things as this pod does. Now, this is not a drug in the pill form or otherwise (intake) but it directly contradicts the “spirit of sport,” all principles of fair play, and general sportsmanship. From the same article is noted, “In 2006 the World Anti-Doping Agency ruled that such oxygen tents enhance performance and violate “the spirit of sport,” but did not add them to the list of banned substances and methods, saying they would wait until further studies were conducted.” How about an update today? Nothing thus far. Cited on pages 32-33 (World Anti-Doping Code). It is contrary to the spirit of sport. None of the three criteria alone is a sufficient basis for adding a substance to the Prohibited List. Using the potential to enhance performance as the sole criteria would include, for example, physical and mental training, red meat, carbohydrate loading and training at altitude. Risk of harm would include smoking. Does the CVAC pod have the potential to enhance sport performance? Does it represent a potential or actual health risk? Does it contradict the spirit of sport? How much of what this pod can do for a person can be considered a placebo effect? These questions and issues presented create a large gray area of our sport. This article should further kick-off the debate and discussion over Djokovic’s CVAC pod and opinions regarding the impact it has had on 2011 in tennis.